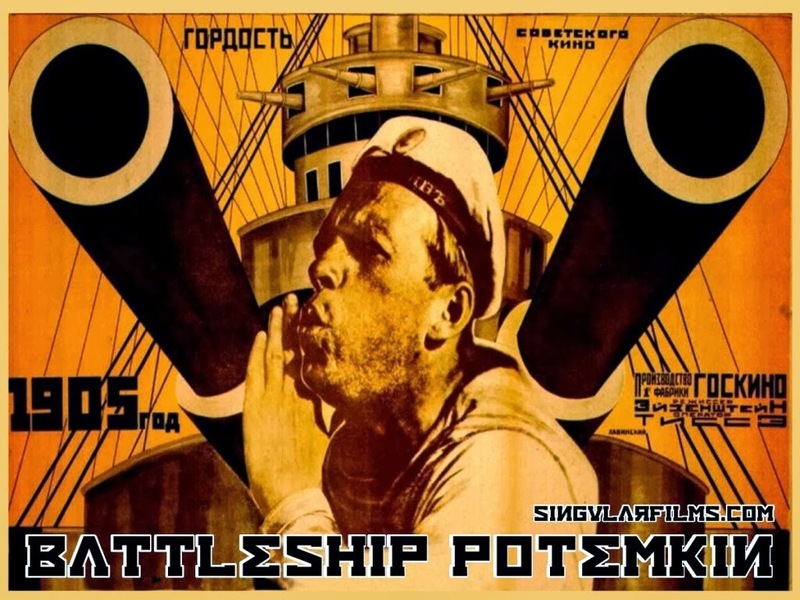 Soviet filmmaker Sergei Eisenstein’s Battleship Potemkin, released in 1925, revolutionized cinema, making its director and Russian filmmaking famous around the world. A master metteur en scene, Eisenstein focused more on the possibilities of film itself than on character development or plot. The director is interested in mass movements, and uses individuals only as representations of the many, fusing sound and images together to create a vast and startling ever-moving painting of often fearsome beauty. The overriding principle in Potemkin, as well as many of the Eisenstein’s other works, is that of kineticism—from the intense movement and dynamism within the frame, to the visual clash of his juxtapositions— which set up the rhythm of his movies and introduced a more sophisticated style of editing than had ever been used before. The film’s most famous and most celebrated scene, the Odessa steps sequence, is a triumph of what would be known as Russian montage, but it functions as only one piece of a whole which in the end ads up to so much more than the sum of its parts. 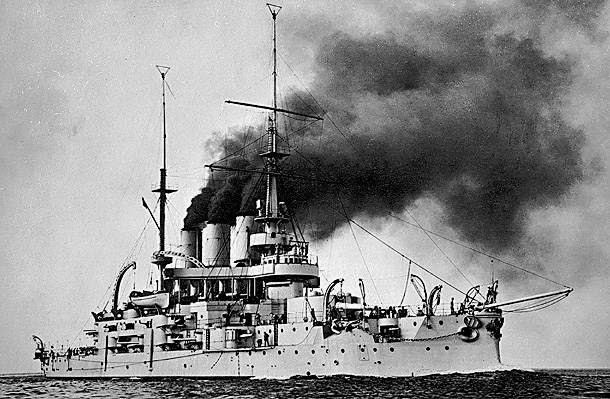 Potemkin chronicles a series of movements of the aborted 1905 Russian revolution, starting aboard the titled ship. 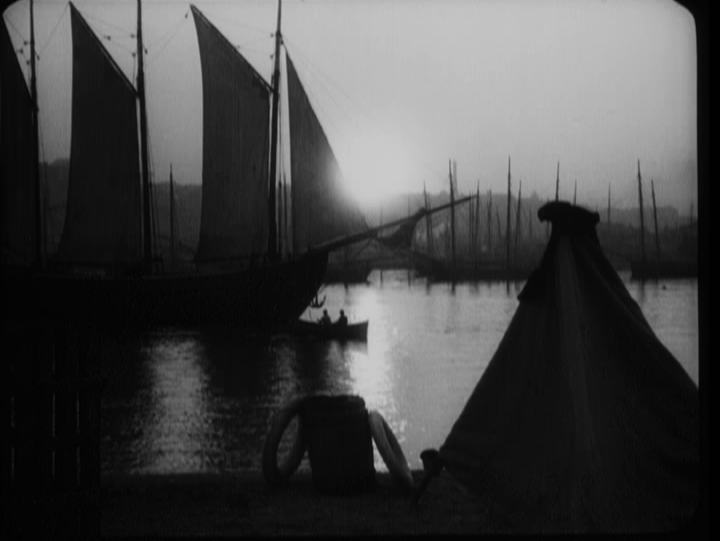 A long shot of the rolling waves of the Odessa harbor in the beginning of the film sets the stage, because the men aboard Potemkin are indeed sailing troubled waters. Title cards inform us that “the spirit of revolution soared,” and individualism gave way to the voice of masses, which was driven by the “revolutionary élan.” The first to inspire disobedience to the “petty officers” aboard is Vakoulintchouk, saying that “all of Russia has risen” and they should not be the last. 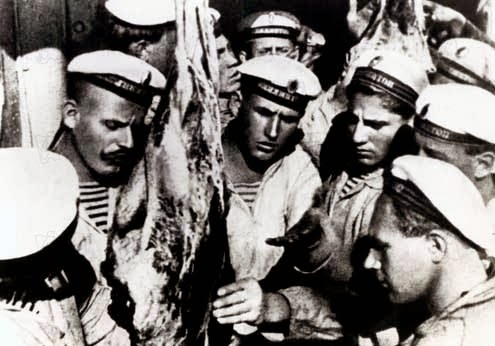 The men are fed up with having to eat rotten meat so infested by worms that it “could crawl overboard on its own.” “These are not worms,” the ship doctor informs them, as a disquieting close-up of the wriggling vermin fills the screen. End of discussion. From these first few scenes in the first part of the film, we get a sense of urgency, brought on by the constant movement within the frame. Nothing is ever quite still. As the sailors clean, oil, scrub, wash, and cook, a sense of rhythm is deftly created. They work in perfect unison, in tune with the powerful, pulsing musical score. 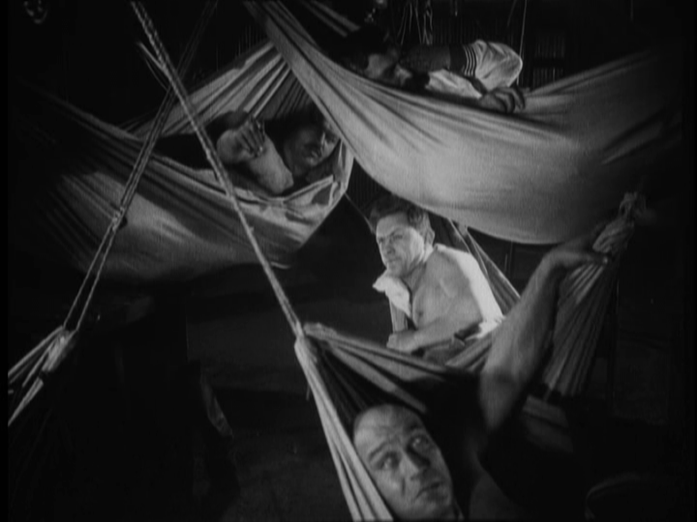 The men work as one, compelled to act, “impotent rage overflowing.” When they do act, overhead shots demonstrate Eisenstein’s virtuoso sense for visual arrangements. The mise-en-scene is symmetrical and dynamic, concentrated along linear geometric designs, a flowing sea of the sailor’s white caps. The music increases in intensity, and the editing becomes more and more rapid, as tension rises. Vakoulintchouk, the first to rise against oppression, is also the first to fall. The next morning, he finds his last resting place in a tent on shore. The light is reflected off the water, birds fly and the ship is finally still. The whole environment seems to mourn the officer’s passing, as Eisenstein provides a rare moment of calm and quiet. We witness an endless procession of people from the city come to pay their respects. Overhead shots of the pier, stretching limitless, are juxtaposed with shots of the Odessa Staircase, filled with hundreds of mourners. Crying women and men, captured in close-ups, vow they will remember how this hero died “for a spoonful of borscht.” The crowd, made up of all classes, comes together, reunited by a common cause while a red flag is run up Potemkin’s flagpole and the rousing music builds. “Like a white-winged flock,” boats gather around the battleship bringing provisions and good cheer. Suddenly, the peaceful scene is violently disrupted by the arrival of nameless, faceless, robotic Tsarist troops, descending the wide stone steps mechanically, boots falling in cadence, causing the crowd to scatter in all directions, as chaos ensues. Children and women are killed and trampled as the editing becomes more and more frantic, flowing in a fusillade of individual images brought together to underline the horror of the civilian slaughter. Victims are singled out to symbolize the whole. The deliberate association of shots establishes an action-and-reaction relationship between them, drawing the scene out for dramatic effects, prolonging the anguish of the crowd. 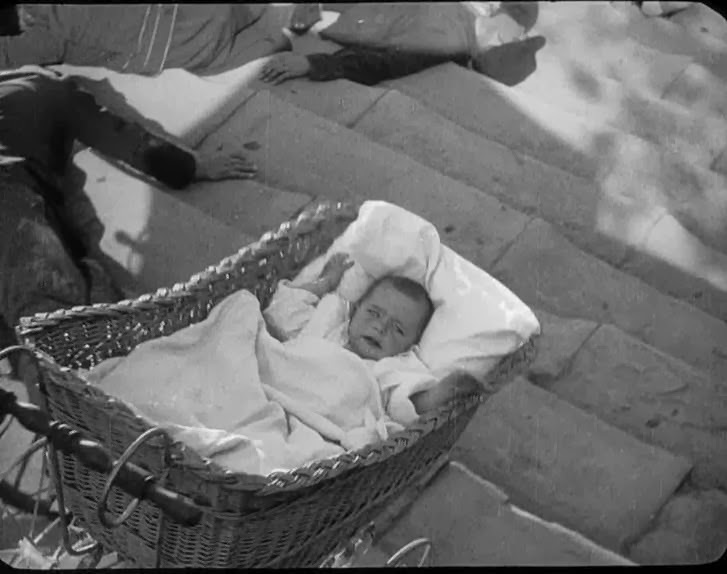 With Battleship Potemkin, Eisenstein proved himself as one of the best filmmakers in Russian cinema. His tendency to capture mass movements and revolutionary montage techniques perfectly fit the revolutionary and violent themes of the film. Watching it, it’s often easy to forget that this is a silent film made almost ninety years ago. Potemkin is as stirring and vivid today as it always has been.